Alex Gordon, as we know him now, is a top-five outfielder on a team surging in the playoffs. We can’t forget the Alex Gordons who came before, though. 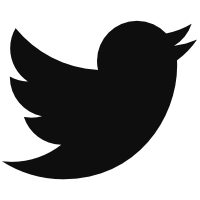 Because it was those struggles that minted the current version. In terms of mindset and mechanics, we wouldn’t have today’s Gordon without yesterday’s. And we might be seeing some of the lessons Gordon learned in play with his younger teammates, too. Getting older and wiser has lead to a change in his approach. But those years — 2010 in particular, when he was sent down — led him to hire a trainer. “Now I do lifts that imitate baseball activities,” Gordon said. No more bicep curls, trying to get big. No more heavy lifting. Changing positions might have also helped him stay healthier, and it has shaped his approach in the weight room. “I was a guy that stayed low in my stance, so going up and down all the time might have hurt my hip or something,” Gordon said. 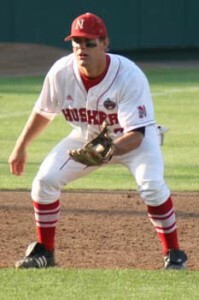 In 2009, he fixed the hip labrum with surgery, and his new position has perhaps allowed him to stay on the field more. He’s averaged 156 games played per season since 2011. Even if you add in Gordon’s minor-league games, he only averaged 127 per season in his first four years. But Gordon has also changed at the plate, and he can also thank the dark years for that. When he first came up, his approach was mostly “see ball, hit ball and try to crush the ball,” as he put it. That led to strikeouts, but not a whole lot of power. “The easiest out in baseball is the lazy fly ball, besides strikeouts,” Gordon said of the lessons he learned back then. He might have had the stadium to thank for the lack of power. “I got carried away with hitting home runs early on in my career, and especially in a big stadium like Kauffman, there’s a lot of balls that you hit to the wall that don’t mean anything,” he said. In 2014, Kauffman suppressed lefties’ home runs by 16%, just a few ticks more hitter-friendly than Oakland’s consensus pitcher-haven (18%). But another part was mindset. “Now I actually have a plan every time I go to the plate, what I’m looking for and where I’m trying to go with it, and what the pitcher is trying to do with me,” Gordon said. A flatter path, a less pull-conscious approach, and a defensive mindset has helped Gordon to a .356 on-base percentage since 2011 — much better than the .328 number he had after his first four years in the big leagues. It hasn’t turfed his power at all to change his focus away from selling out for power. Going all out gave Gordon a .161 isolated slugging percentage in his first four years. His new approach has given Gordon a .170 ISO over the past four years. More balls in play (19.8% strikeout rate since 2011, 22% before) and more line drives (20.7% line drives since 2011, 18.7% before) can do that for you. That better strikeout rate is all part of the plan. “I was striking out a lot because people were getting the outside corner on me and I wasn’t looking to go the other way,” Gordon said. “Now I’m not trying to go up there and slap the ball the other way but now having more plate coverage, it’s helping me out a lot. I’m looking to drive the ball middle, or the other way. But if they come inside, I can still get my bat and barrel inside and pull the ball.” The heat maps agree. 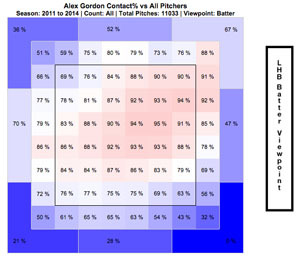 Check out how Gordon’s ability to make contact has changed from his first four years (left) to his last four years (right). You can see his contact zone has grown larger. “Over the last couple of years I’ve tried to cut down on my fly balls and tried to cut down on my strikeouts,” said Gordon, calling attention back to his flatter bat path. 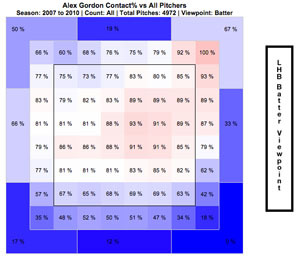 “Line drives and ground balls are going to be key in my approach.” Look at what the change has done for several key stats, and you have to agree with Seitzer and Gordon that they found the best approach for Gordon’s skillset. And when it comes to passing on advice to fellow young players tasting struggle in the big leagues, Gordon thought that attitude was as important as work ethic. “The one thing I can tell you is to come to the field and have the right attitude and have the right mindset, and have fun,” Gordon said. “Once you come to the field and it’s not somewhere you want to be or not something you’re having fun with, and you’re worried about how you’re going to do on the field, it’s not going to turn out well.” Maybe we’re beginning to see that right now. And yet none of this would be possible without the dark times he went through just four years ago. We hoped you liked reading The Good That Alex Gordon Got From Being Bad by Eno Sarris!